Pushing the boundaries of skin rejuvenation – Dr Clark is pioneering more comfortable means to inject Restylane Vital. Restylane Vital, as we all know, is the only stabilised hyaluronic acid skin rejuvenation treatment available on the market. The results are fantastic and patients are always extremely satisfied with their new, young and fresh looking skin. There has always been one drawback though – until now, that is! 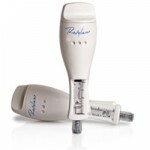 Dr Clark is pioneering single entry point techniques to administer Restylane Vital into the skin. In the past Restylane Vital treatments involved multiple droplets of hyaluronic acid to be placed at 1cm intervals deep into the skin to promote hydration and moisture in the skin. Many patients were shy to undergo the procedure due to the multiple injections it took to complete each procedure. Then even more so when they realised the treatment protocol required at least two treatments. Hence Dr Clarks desire to alleviate the needle phobia and allow all his patients to benefit from this “wonder” anti-ageing treatment. The new technique involves using a micro-cannula to place the hyaluronic acid beneath the skin. Dr Clark can now make a single entry point – sometimes two – and then effortlessly and painlessly use a micro cannula to dissect beneath the skin in something of a fan technique. Dr Clark will cover the area beneath the skin injecting as he goes to achieve the same result as with multiple needle entries. The advantages of using the micro-cannula don’t just stop with the benefit of fewer injections. Micro-cannulas’ are proven to offer better safety and less pain than traditional needle injections. The cannula blunt tip causes little or no trauma minimizing bruising risks and the lack of trauma also means less pain. Of course not all indications for Restylane Vital are suitable for micro-cannula techniques, but if you are interested in rejuvenating your skin and reversing the visible signs of ageing, then visit Dr Clark and let him discuss all your aesthetic options.